Veterans Day is a time to recognize and thank family members, friends and others who've worn the uniform for their service to our country. For those who have served, it's also a time to share stories and remember fellow veterans. And when it comes to sharing reminiscences, few can keep up with a special guest at a ceremony held in Rochester to commemorate Veterans Day. 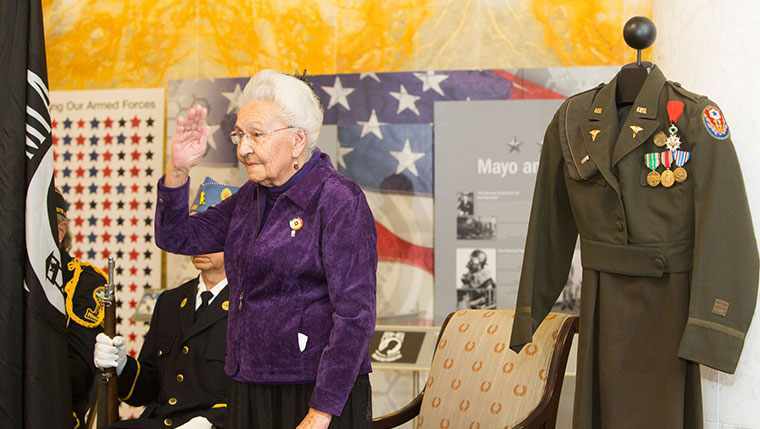 Marcella LeBeau, a 95-year-old Native American (Lakota) World War II Army Nursing Corp vet, treated some of the first casualties at the Battle of the Bulge and on D-Day. She was awarded France's highest military accolade, the French Legion of Honor, for her service. LeBeau shared a few stories, including one of a soldier she encountered during WWII and for whom she searched for 40 years afterward. She was working night duty on the shock ward at the 76th General Hospital, a 1,000-bed tent hospital in Liege, Belgium. Another nurse asked her to visit Eugene Roubideaux, who was Native American and had both legs amputated above the knee. LeBeau's colleague thought it would help if she visited him. And so she did, numerous times, and talked with him about the D-Day landing, took him newspapers from home, and offered to write letters for him. Then one day, he was gone from the unit. That was the last she heard from the soldier for 40 years, until a chance encounter with his daughter at the Indian Health Service hospital where she was working. LeBeau says she didn't know if the soldier would remember her, but Roubideaux told his daughter, "I'll never forget." And it turns out, he had gone on to help other amputees and was a role model for other veterans, she says. Years later, he joined LeBeau and others for a Veterans Day ceremony. and to bring peace to our world by these valiant men. filled with emotion that words can never express. LeBeau was invited to Mayo Clinic to share her unique perspective by the Veterans Mayo Employee Resource Group and the Celebrate Dakota! Mayo Employee Resource Group, working in partnership with the Office of Diversity and Inclusion. She is the granddaughter of Chief Four Bear, Lakota leader of the Two Kettle Band of the Lakota Nation, and former director of nursing for the Indian Health Service in Eagle Butte, S.D. She also has made a career of encouraging other Native Americans to enter the nursing field. Click here to see images of Veteran's Day events on Mayo Clinic campuses, then share your comments below and share this story with others via the social media tools above.